A comal is a smooth, flat griddle typically used in Mexico and Central America to cook tortillas, toast spices, sear meat, and generally prepare food. Similar cookware is called a budare in South America. Some comals are concave and made of "barro" (clay). These are still made and used by the indigenous peoples of Mexico and Central America. Comals are similar to the American griddle or the Indian tava, and are often used and named interchangeably with these. Comals for home use are generally made from heavy cast iron, and sized to fit over either one burner on the stovetop (round) or two burners front to back (elongated oval). In many indigenous and Hispanic cultures, the comal is handed down from grandmother to mother to daughter, the idea being that a comal tempered over many years of usage will heat faster and cook cleaner. The history of such cooking methods dates back to the pre-Columbian era, when nixtamal maize tortillas were cooked on a comal over an open fire. Comales were also used to toast coffee and cacao beans. 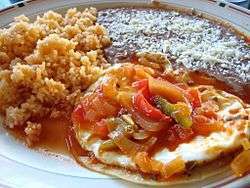 The word "comal" comes from the Aztec Nahuatl word comalli. Originally they were thin ceramic pieces, with slightly raised edges. They are found through the archaeology of Central America with the earliest examples dating to 700 BCE. ↑ Chelsie Kenyon. Knack Mexican Cooking: A Step-by-Step Guide to Authentic Dishes Made Easy. Rowman & Littlefield. pp. 12–. ISBN 978-0-7627-6206-4. ↑ Paula E. Morton (15 October 2014). Tortillas: A Cultural History. UNM Press. p. 14. ISBN 978-0-8263-5215-6.